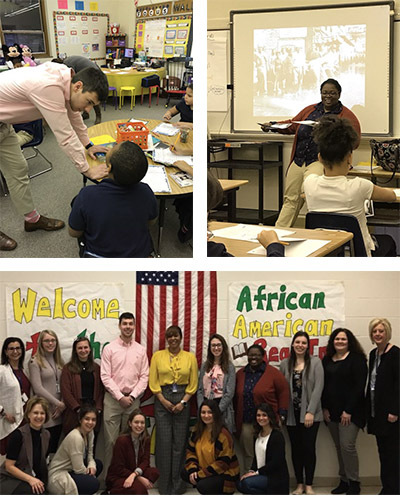 NEW WILMINGTON, PA – Ten Westminster College School of Education juniors and seniors shared interactive read aloud lessons with children at Farrell Elementary School during the National African American Read-In on Wednesday, Feb. 27. Westminster’s early childhood education students enrolled in the Emergent Literacy course join in this national celebration at Farrell Elementary each year, collaborating with kindergarten through third grade teachers and students. The annual event, established in 1990 by the Black Caucus of the National Council of Teachers of English, provides the opportunity to share books that value and elevate African American experiences. “One student thanked me for having a book with a boy that looks like him,” said senior Hannah Grippo. Junior Lauren Durbin said books that expose children to different races and religions and celebrate their own cultures can be a powerful tool. “Young children can begin to understand that not everyone is the same as them—and that is OK,” said Durbin. Junior Dylan O’Hara said this annual event has been valuable teaching and learning experience for him. Dr. Charlene Klassen Endrizzi, professor of education at Westminster, said that although the nation continues to experience racial struggles, she is hopeful when she considers the cultural awareness of Westminster’s preservice teachers. “The simple decision to share books that value diverse cultures can lead to essential, complex conversations,” she said.